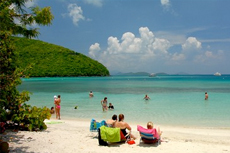 See all the best of the beautiful St. Thomas with a guided tour of the immaculate island. Same narrative going into Charlotte Amalie and coming back to the ship. Small group taxi that hit all the highlights and even a couple of hours at the beach. Our tour of the Island was beautiful. We took a cruise line tour to St.
We took a cruise line tour to St. John. We got on a boat for a 45 minute ride over to St. John. Then boarded an open air truck to tour St. John. Beautiful island and views! Took a little longer as they were dropping off couples at a couple of different resorts and parks on the island. Otherwise great tour up to the scenic view point and Mountain Top for some Banana Daiquires. We had nothing planned for this day and were just looking for a taxi to downtown. We had nothing planned for this day and were just looking for a taxi to downtown. We hitched a ride and never left the taxi. The guide was thorough and knowledgeable. We would like to go back here as well. Beach was very nice. They didn&apos;t bring back to the shipwhen we were finished but dropped us off to shop which we didn&apos;t want to do. We had to wait awhile before we could get our bus back to the ship. Drove around to hill tops looking at the same thing from different views. Drove around to hill tops looking at the same thing from different views. Over priced. The last time I was in St.
Found tour on shore. It was an open air bus. Tour Operator provided service they promised including free beverages. This was a nice overview of the island, and Brenda & Franko were very hospitable. This was a nice overview of the island, and Brenda & Franko were very hospitable. We did miss a couple of views simply because of rain, but really an enjoyable time. I tried the banana daquiri at Mountain Top, and it was delicious! It was raining when we first arrived at the top, but after about 10 min it cleared out and we were able to see the other islands. The bus was newer and rode well. Driver was informative about the town and history. $25 per person for a 2 hour tour. $25 per person for a 2 hour tour. It was nice in an open vehicle. Our driver and tour guide was super nice. Wish we would have been able to stay longer on the island. 7-1 was not enough time. Went on island tour on open air truck. The tour was a ride to the top of the highest point on the island. Excellent tour, only skipped on star because we did not really get to see Charlotte Amalia. Excellent tour, only skipped on star because we did not really get to see Charlotte Amalia. But great guide, gave us a real Caribbean feel. Took an open bus tour; they are right at the dock. Took an open bus tour; they are right at the dock. Couldn’t hear tour guide. Not particularly informative during the ride or at the stops. We really enjoyed the island of St Thomas. Most tour vehicles are open-sided truck-buses. Great overview trip with photo spots, highlights and beach stop. Great overview trip with photo spots, highlights and beach stop. Transport was not overcrowded and they gave us drinks.